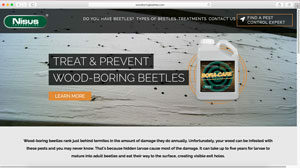 Nisus has launched WoodBoringBeetles.com. Having been in the pipeline for the last year, this new site can help homeowners identify whether they have a wood-boring beetle issue and how they can treat the problem. Four major species of beetles are responsible for most beetle-based structural damage to wood, and it can take up to five years for larvae to mature into adult beetles and eat their way to the surface, creating visible exit holes. The site explains to homeowners how to identify beetle damage, what kind of beetle might be infesting their homes, and options for controlling the problem using a pest management professional.